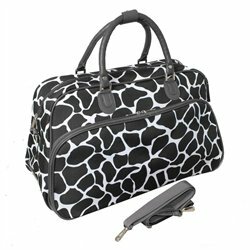 Add a little grace and fun to your itinerary and feel the difference of traveling in style and comfort with this Giraffe shoulder bag. Romantically styled with an all-organic EVA construction. A true travel companion, this grab-and-go bag gives you a structured shape and vibrant patterned exterior to fit your lifestyle and express your personality. Available in brown and pink.